Imagine sitting comfortably at one’s desk accomplishing work for the day when, all of a sudden, a throbbing, pounding ache begins to occur in one’s head. This impedes the workload for the day, making it harder and harder to concentrate. 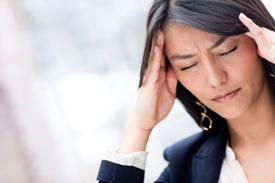 If this is something you have experienced, then you may be coping with tension headaches. This can be brought about by poor, repetitive posture due to how one is sitting at a desk. What can be done to help? These are great suggestions to avoid future tension headaches. However, it is important to note that some damage may already be done. If a misalignment has occurred in the upper neck, it must be addressed so as to attempt to ensure a headache-free future. Good communication in the body is vital to its proper function. The spine has the important job of protecting the spinal cord. The spinal cord is the communication highway of the body. If the top bone of the neck – the C1 vertebra – becomes misaligned, communication can become hindered. Case studies have shown the effectiveness of having the atlas bones corrected. A total of 47 patients who were suffering from non-migraine type headaches received care from an upper cervical chiropractor over a two-week period. They all reported a significant reduction in headache pain. After about 4 months of care, they stated that their symptoms had reduced by 75% on average. At Wellspring Centre for Body Balance, we use a gentle technique to assist patients in realigning the upper cervical spine in the hopes of reducing or eliminating tension headache pain.